With less than a week to go until the Olympic women’s 20k race walk, 2009 World silver medalist Olive Loughnane takes time out of her busy schedule to chat to James Sullivan. Olive Loughnane is an elite race walker from County Galway, Ireland. She has represented her country in major championships for over a decade and will contest her 4th Olympic Games in London. 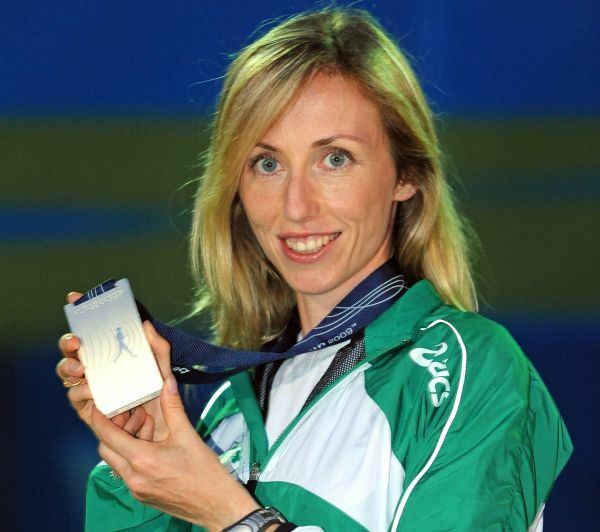 At the 2008 Olympics in Beijing she finished in 7th place in the 20k walk in a personal best of 1:27:45, second on the Irish all-time list after 2003 World silver medalist Gillian O’Sullivan. The following year she emulated her compatriot in taking the silver medal at the World Championships in Berlin, becoming only the 4th Irish person to claim a medal at the championships since their foundation in 1983. Olive: I joined Loughrea Athletic Club when I was 12 years old. Olive: I loved to watch the Olympics. I remember the Coe/Ovett era and of course John Treacy’s Olympic silver medal in LA. Olive: I was always curious about it. The club coach suggested I try it. I did it in the National League and it pretty much took off from there. James: You finished 35th at your debut Olympic Games back in Sydney 2000. How important was that experience in your development from international novice to world-class athlete? With this in mind, should young up-and-coming athletes on B-Standards be sent to London to assist in their development? Olive: I was ranked 52nd going into the Sydney so 35th was a good performance. The A standard at the time was 96 minutes and I did 94:59. Gillian O’Sullivan, who finished 10th, also had an A standard. The distance of the race went from 10k to 20k for Sydney so the standard was a bit more relaxed. That helped me get my foot on the ladder. Do I think B standards should go? There are definitely a few obvious candidates. Mark English is a huge talent and consistently performs as does Thomas Barr. The Olympics are different to any other competition and there’s definitely an element of “event acclimatisation”. The quicker an athlete gets that out of the way the quicker they can perform. Different events have different age profiles so it would have to be decided on a case by case basis. For this to work, there would have to be a high level of trust between athletes and selectors. James: You made your big breakthrough at the Beijing Olympic Games, where you finished in 7th place, Ireland’s highest placing in athletics, and set a personal best time of 1:27:45 in the process. How would you describe that experience? Olive: The race was the quickest race in history. It was one of those days when everything seemed to work. The race started very quickly. I held back from 4k to 8k and then let loose. I was the quickest in the field for the second 10k. In the end I ran out of road. James: At the 2009 World Championships in Berlin you claimed the silver medal, becoming the 4th Irish person to reach the podium since the championships began in 1983. Can you put that experience into words? Olive: I went into the race thinking “there are not three people stronger than me today”, but on the world stage you never know who’s going to spring a surprise. I was in a medal position from 13k on. The girl in 4th was on two warnings so she wasn’t in a position to chase. From 13k to 18.2k it was all about the colour of the medal. The Chinese girl clung on and clung on but eventually I pulled away. Despite the fact that I felt strong going in, I was a bit stunned after. It took a while to sink in fully. I think when I walked out for the medal ceremony it really hit me. James: Do you ever stop and reflect on being in the illustrious company of Eamonn Coghlan, Sonia O’Sullivan, and Gillian O’Sullivan as Irish World Championship medallists? James: Since Berlin you have had a few disappointments, namely the European Championships in Barcelona and the World Championships in Daegu. How would you assess the last couple of years? Olive: I’ve also had strong performances in 2010 and 2011. I had one of the top 10 quickest times in the world in 2010. In 2011 I had a good race in European Cup. European Cup is not divided into divisions for walks. I was in a very clear 2nd and in the hunt for gold when I got disqualified with 600 to go last year. It hasn’t been all doom and gloom, I’ve just been getting all my major championship bad luck out of the way! James: In Daegu the humidity levels reached 88% for the women’s 20km walk. How difficult was it competing in such conditions? Olive: Daegu was a very disappointing race a whole lot of small things went wrong. The humidity was the straw that broke the camel’s back. I raced in similar conditions in mid-June this year. I finished 2nd in a time of 91:33 so I’m glad to have put that ghost to bed. James: What are your goals for London? How are your preparations for the Olympics coming along? Olive: Preparations are going well. I want to have my best Olympics ever. James: Can you give us an insight into the training schedule of a race-walker? What would an average week of training be like, specifically in terms of key sessions and total mileage? Olive: I don’t do very high mileage but what I do is quick. I do about 120 kilometres a week. I train 6 days, twice on 5 of those days. I do a long walk once a week i.e. 20-25k. I do one strong session a week. The focus of the session, threshold or above threshold depends on where I am in the season. My longer walk is usually in the morning. I also hit the gym twice a week. Upper body strength is important for race walking. Olive: I’m not a fan of all out speed, say 10*400. Sometimes I piggyback on a club running session to get pulled through. I like long distance now. It used to be the reverse. James: How do you juggle the demands of being a professional athlete and a full time mother? Olive: With great support from my family! Olive: The people who see us out training know how quick we are. Our peers on the team know how fit and strong we are. They are the people who matter most. James: In recent years the organisers of major championships have staged the race walking events on a 1 or 2 kilometre lap circuit in the centre of the host city. It is great for spectators, but can it be boring for competitors, doing for example, 20 laps of the same circuit during a race? Can keeping full concentration in a race like that be an issue? Olive: I actually find 2k laps help my concentration. It’s easier to break the race down. Taking the competition into the city centre as opposed to doing laps close to the stadium has increased the crowds. There was a great atmosphere in Berlin. Olive: With the cuts in RTE and the logistics involved I can understand a little why there was no TV coverage in Daegu. It was very disappointing that there were no print journalists there. You’d like to think that better performances would lead to better coverage but Berlin in 2009 was our best ever World Championships. I don’t really know the answer to that one. Olive: I am 100% behind the fight against doping. I wish that other athletes were subject to the same level of testing as we are. That said, I don’t become obsessed about it. The reality of the situation is that my job is to beat everybody, irrespective of what they are or are not taking. Worrying about whether they are dirty or not won’t help that cause. Olive: I love watching high jump and I’d love to see Mo Farah do the 5K/10K double in London. James: That’s great Olive. Thank you for your time and the very best of luck with your preparations for London.